Noticing cells positions. Possible for 8 positions. The reentry will be carried out with the same Button. Jumps over Workbooks limits possible. The address is announced at the "TooltipText"
The "Pos.- button" shows the cell contents. Not required groups can be hidden. The Commandbar therefore gets shorter. "Pos.- Button" caption width can be selected. 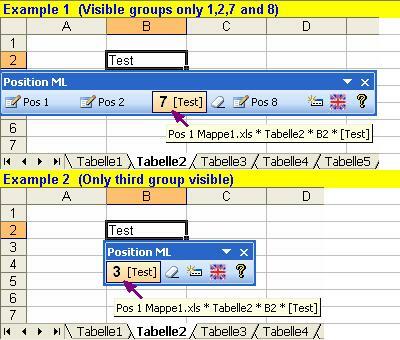 The positions can be saved when, exiting Excel. Copyright © 2004 Bernd Augustin GmbH. All rights reserved.